The utility Reset Password can also be used to reset home folder permissions. Screen shot courtesy of Coyote Moon, Inc. Your home folder is the center of your Mac universe; at least, it's where you store your user data, projects, music, videos, and other documents. Just about anything you work on will have a data file of some type stored away in your home folder. That's why it can be very troubling when you suddenly have issues with accessing data in your home folder. The problem can show its face in many ways, such as being asked for an administrator password when copying files to or from your home folder, or being asked for a password when putting files in the trash or deleting the trash. You may also run into login issues where you can log into your Mac, but your home folder isn't available to you. All of these problems are caused by corrupt file and folder permissions. OS X uses file permissions to determine who has the right to access a file or folder. This keeps your home folder reasonably secure from prying eyes; it also explains why you can't access someone else's home folder on a shared Mac. At this point, you may think you need to run Disk Utility's First Aid, which can repair file permissions. The problem, as silly as it sounds, is that Disk Utility only repairs drive permissions on the system files located on the startup drive. It never accesses or repairs user account files. With Disk Utility out of the picture, we must turn to another method of fixing user account file permissions. There are a few utilities that can tackle this problem, including Permissions Reset, a Tom's Mac Software Pick. But while Permissions Reset can fix a file or folder of items, it's not a great choice for something as large as a home folder, which contains many different files with different types of permissions. A better choice, if a bit more cumbersome, is Password Reset, another utility that is built into your Mac. In addition to resetting a forgotten password, you can also use Password Reset to repair file permissions on a user's home folder without actually resetting the password. 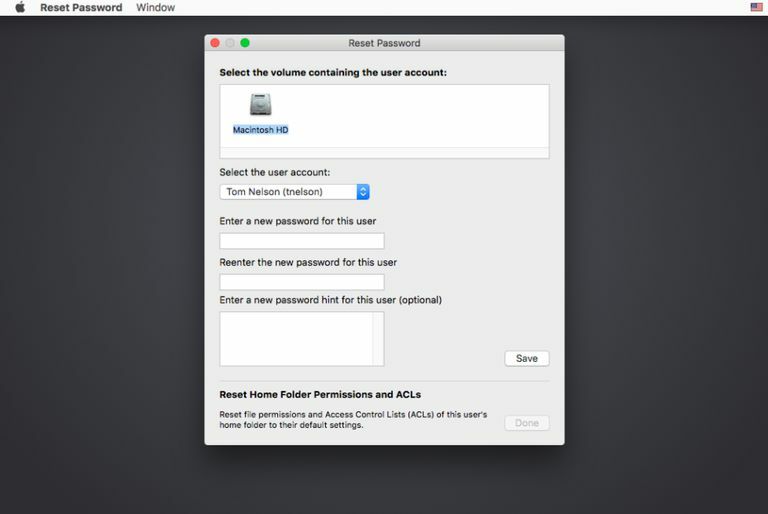 The Password Reset utility is available either on your OS X install disk (OS X 10.6 and earlier) or on the Recovery HD partition (OS X 10.7 and later). Since the way to use Password Reset changed with the introduction of Lion, we will cover both the Snow Leopard (10.6) and earlier version, and the Lion (OS X 10.7) and later version. Once you complete the process of resetting user account permissions, you can enable FileVault 2 once again after you restart your Mac. Close all applications that are open on your Mac. Locate your OS X install disk and insert it into the optical drive. Restart your Mac by holding the c key while it is booting up. This will force your Mac to start from the OS X install disk. The startup time will be a bit longer than usual, so be patient. When your Mac finishes booting, it will display the standard OS X installation process. Select your language, then click the continue or arrow button. Don't worry; we won't actually install anything. We just need to get to the next step in the installation process, where the Apple menu bar is populated with menus. From the Utilities menu, select Reset Password. In the Reset Password window that opens, select the drive that contains your home folder; this is usually your Mac's startup drive. Use the drop-down menu to select the user account whose home folder permissions you wish to fix. DO NOT enter any password information. DO NOT click the Save button. Instead, click the Reset button located just below the "Reset Home Folder Permissions and ACLs" text. The process may take a while, depending on the size of the home folder. Eventually, the Reset button will change to say Done. Quit the Reset Password utility by selecting Quit from the Reset Password menu. Quit the OS X Installer by selecting Quit Mac OS X Installer from the Mac OS X Installer menu. For some reason, Apple removed Reset Password from the Utilities menu in OS X Lion and later. The application that is used to reset passwords and user account permissions is still present, however; you just have to start the app using Terminal. Start by booting from the Recovery HD partition. You can do this by restarting your Mac while holding down the command + r keys. Keep holding the two keys until you see the Recovery HD desktop appear. You will see the OS X Utilities window open on your desktop, with various options available in its window. You can ignore this window; there's nothing we need to do with it. Instead, select Terminal from the Utilities menu at the top of the screen. The Reset Password window will open. Make sure the Reset Password window is the frontmost window. Then follow steps 6 through 14 in the "Reset Password - Snow Leopard (OS X 10.6) or Earlier" section to reset the user account's permissions. Once you quit the Reset Password app, be sure to quit the Terminal app by selecting Quit Terminal from the Terminal menu. From the OS X Utilities menu, select Quit OS X Utilities. You'll be asked if you really want to exit OS X Utilities; click the Restart button. That's all there is to resetting your user account's file permissions back to the correct default settings. At this point, you can use your Mac as you normally would. The problems you were experiencing should be gone.